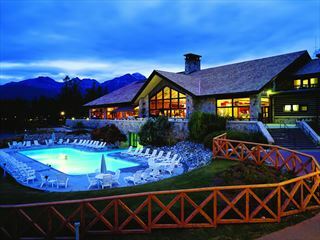 Situated just a five-minute drive from the east gate of Jasper National Park, which covers over 4,200-square-miles of mostly unspoiled alpine wilderness, Pocahontas Cabins make an ideal base for experiencing the abundance of wildlife, outdoor adventure and stunning natural beauty the park is known for, much of which can be enjoyed right outside your door. Look forward to hiking or biking the trail system in the summer and skiing Mount Basin in the winter, as well as enjoying activities right onsite, like the seasonal heated outdoor pool open during the warmer months, and the outdoor hot tub, ideal for soaking your cares away all year round. Guests will find dining right onsite at the poolside Poco’s Café & Lounge, and can take advantage of the outdoor BBQs to grill up a delicious meal. The property also hosts a mini-putt golf course and playground, making it ideal for families with children. Miette Executive Cabins – The Miette Executive Cabins include two upper-level bedrooms, each with a king-size bed, as well as a fully-equipped kitchen with microwave and dishwasher and a living room with a fireplace, TV and DVD player. They also feature a dining area, a private main floor deck and one-and-a-half bathrooms, a bathroom with a shower on the upper level, and a half bathroom on the lower level. 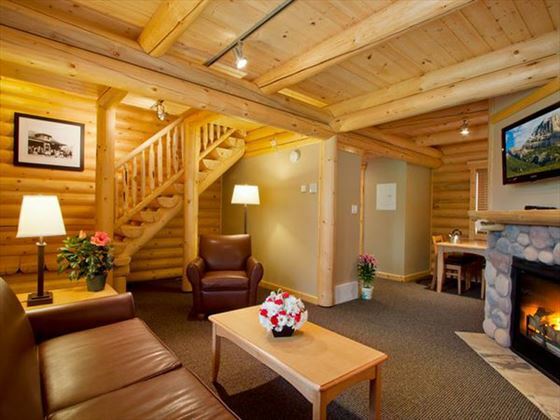 Cedar Lodge Luxury Suites – These cabin suites include two queen-size beds in an upstairs bedroom with a full private bathroom, as well as a queen-size bed in the open loft area upstairs; a second full bathroom is located on the lower level. Additionally, there is a private balcony on the upper level, a stone fireplace, a TV and DVD player, spacious dining area and a TV with a DVD player. The main floor living area includes a double sofa hide-a-bed. 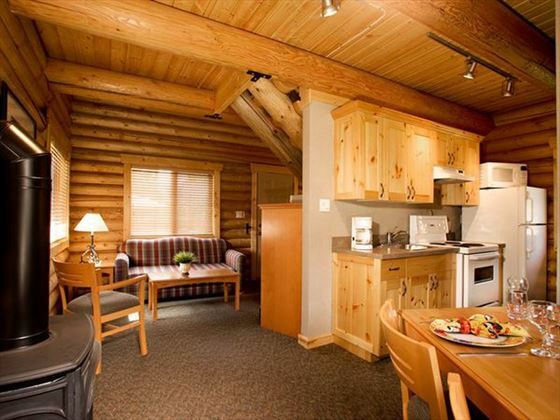 Cedar Lodge One Bedroom Suites – The Cedar Lodge One Bedroom Suite includes a bedroom with a queen-size bed, a double sofa with a hide-a-bed in the living room, and a full bathroom. It also includes a living area with a fireplace, TV and DVD player, and a small refrigerator and microwave. Executive Log Cabin – This cabin includes two queen-size beds in an open loft and a living area with a double sofa with a hide-a-bed. It also has a TV with a DVD player, a fully-equipped kitchen with a microwave, a full bathroom, fireplace and private deck. 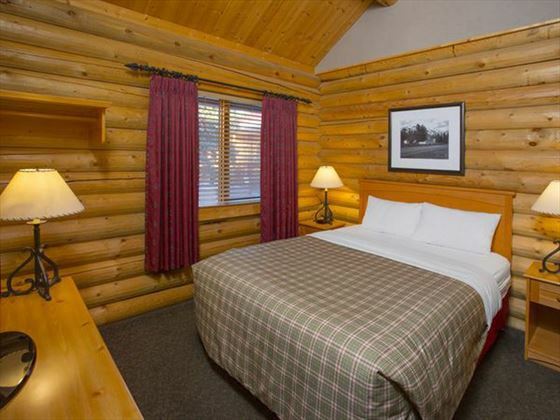 Deluxe Log Cabin – The Deluxe Log Cabin features one bedroom with a queen-size bed, a living room with a double sofa with hide-a-bed, a full bathroom and a fully-equipped kitchen with a microwave. It also includes a private deck, fireplace and TV with DVD player. Panebode Motel – These rustic motel units include one queen- and one double-size bed, and a bathroom with a stand-up shower. 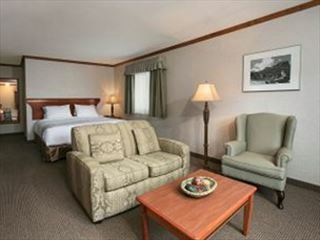 They also feature a small refrigerator, microwave, TV and DVD Player, as well as a patio with patio furniture. Pioneer Cabins – The Pioneer Cabins are a seasonal option that includes a bedroom with a double-size bed and a double sofa bed in the living area. It also features a kitchenette with an electric two-burner hotplate, a refrigerator and microwave, as well as a TV, outside deck and full bathroom. Miners’ Cabins – The seasonal Miners’ Cabins include one queen- or two double-size beds, a pull-out couch, a full bathroom, refrigerator and microwave, as well as an outside deck and a TV. 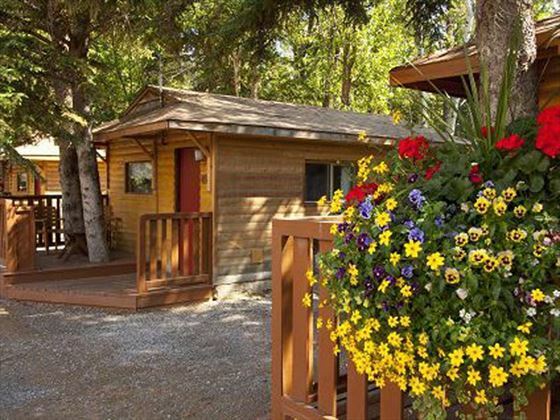 Settler’s Cabin – The seasonal Settler’s Cabin hosts a private bedroom with a double-size bed as well as a queen-size bed and pull-out couch in the living room. It also includes a full bathroom, a TV and an outside deck. Poco’s Café & Lounge is located onsite at poolside, and is open for breakfast all year, and dinner during the summer. It offers a variety of entrees, pizza and sandwiches. Pocahontas Cabins are located in a scenic, tranquil location, a 5-minute drive from the East Gate of Jasper National Park and a 25-minute drive from the town of Jasper in Alberta’s Rocky Mountains. 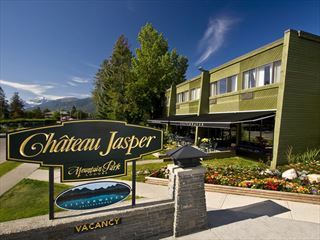 Sitting conveniently along the Marmot Basin ski shuttle route, the Mount Robson Inn is perfectly situated for city exploring, shopping and the popular attractions that Jasper has to offer.